I like snakes. This weekend I will be collecting my new snake, he’s a baby Royal Python. I have been worried about the temperature in the vivarium I will be housing him so I built an ethernet enabled monitoring device to do a science! In March I went to the first Makerfaire in the UK. The Newcastle-upon-Tyne Makerfaire was part of Newcastle Sciencefest. Its not that far from where I live so I drove up there for the day. There were lots of kewl stuff as you’d expect. I particularly liked the electro-mechanical fire breathing horse robot. Amusingly I met one of the Microsoft guys who’d demonstrated the Microsoft interactive table at PHP London. He was there with his cheap, home brew, version of the table which used back projection of the image and a camera to detect the finger position. The guy with the UK101s who I’d met at Techadventure was also there. Naturally there was an O’Reilly stand as they are publishers of both Make and Craft magazines. They had a pile of kits from Adafruit including the boArduino. 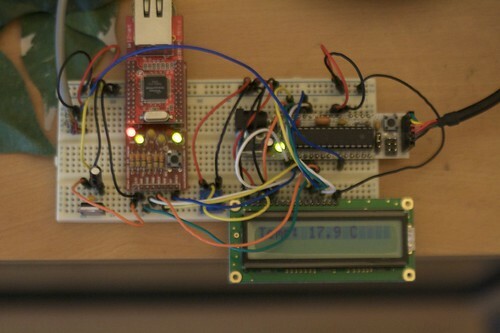 This is an Arduino clone designed to plug in to a breadboard. There are two versions. One with a USB to Serial adapter on board and one which has a power supply onboard but requires TTL level serial which can be easily supplied by an FTDI lead. I bought one of the latter. The kit languished on the shelves at my computer workstation until about a month ago when I decided to solder it together and play with it. Its a through hole double sided board which is relatively packed and so requires some experience of soldering. Apart from stupidly soldering in a LED the wrong way around and then having to desolder it and obtain a new one I had no problems. It worked first time! Limor aka Ladyada, who designed it and runs Adafruit makes good stuff. I videoed it using my G1 phone (hence the poor quality due to low light). I have the Arduino IDE running on my MacBook. The FDTI lead is based around a common part with easily obtainable drivers for Windows, OS X and Linux.